Whether you're an avid Starbucks lover like myself, or are more into the local cafe scene, there's a high chance your favorite coffee place has an assortment of holiday beverages. I have a Starbucks on campus that I go to (far too often than I want to admit), and I probably go even more during the holiday season because everything is much more festive when I have a Caramel Brulee Latte or Peppermint Mocha in my hand. 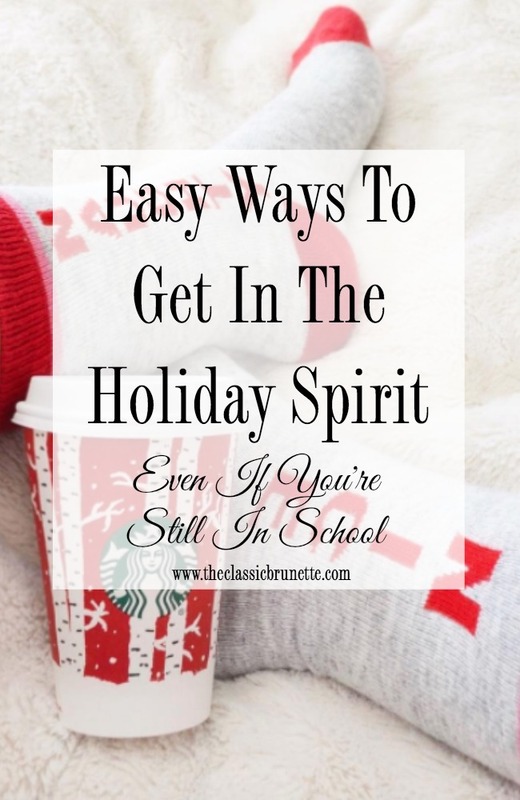 It's a super easy way to start slowly getting into the holiday season! My roommates and I threw a small white elephant party this year and it was so fun! Friends bring goofy gifts that you can swap and steal, and it always ends up being a blast. I've also been to ugly sweater parties, cookie swap parties, etc that have been super fun. Whatever themed party you host or attend, even if it's literally just a "holiday party," will get you out of the fall mood and ready for all the festivities! Gathering with all your friends and family is a sure way to keep spirits bright and have a good time. Obviously I didn't do this manicure by myself, haha! I went to a nail salon and asked if they could do a reindeer, and it turned out so well. My roommate also got a super cute holiday manicure and got a traditional ugly sweater pattern manicure. It might just be me, but every time I look down at my manicure I get a little smile on my face and think about how excited I am for the holidays! If you can't afford to go get a manicure, you can definitely do your own simple nail design too! And just in case you're stuck for ideas, I've been pinning a bunch recently on this Pinterest board! My roommates love to go all out in our house for the holidays. When it's Halloween our place is covered with spider webs, skeletons, and creepy spiders, but Christmas hits and it's a whole other level. We have a full sized fake Christmas tree with lights built in, my roommate made a big ornament wreath that's hanging outside our house along with a few lines of Christmas lights, and we even decided to wrap a few empty boxes this year to make our tree look a little more full. So we might be a little crazier than most, but it's great because it's a fun thing to do while procrastinating for finals, and also a great reminder that we'll be back at home with our families soon! If you can't get a real Christmas tree, or you just want to be surrounded by the stereotypical smell of the holidays, the best thing to do is go to a Christmas Tree farm. If you're in the US, there's probably one every few miles, at least that's what it feels like driving around here in SoCal! Like I said in the last tip, we have a fake tree, but I absolutely love the smell and look of real ones. Visiting one of these places would be a great little day trip or study break to get your mind off school! These are actually cookies that my sister made a few days ago! I love holiday baking, especially when it involves decorating cookies. I've been meaning to dive into some fun Pinterest recipes, but finals and life haven't really made much time for baking lately. But if you're a person who loves cooking or baking regularly, making some snowmen or reindeer cookies would be a great activity for you! 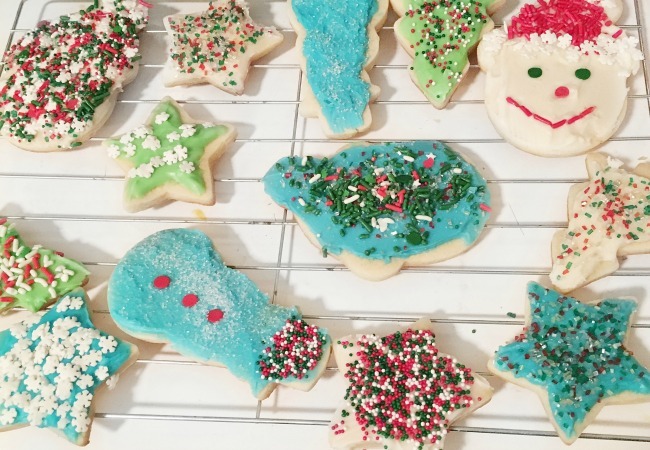 I think it would also be super fun to gather a few friends and decorate some cookies together, even if you do it with pre-made holiday ones from the grocery store. Some people take photos for their Christmas cards, others just buy some simple holiday stationary and send them out to friends and family. Last year my roommates and I took a photo with three of us dressed like elves and one of us as Santa, but this year I don't think we're planning anything. I think that sending and receiving holiday cards is fun for everyone involved. It's also a good way to let the people in your life that you're close to know that you're thinking about them. What's your favorite way to get into the holiday spirit? Oh my gosh, your reindeer manicure is ADORABLE! I totally have been listening to Christmas music and sipping Christmas coffee blends for weeks and it's really helped while I've been studying for finals. Good luck finishing out the semester girl and happy holidays to you! I love your reindeer nails! Now I feel plain for just getting glittery red polish lol :) This is a great list! If you have any good christmas treat recipes you should share those on here too. I've been looking for some! I love your reindeer manicure! Those cookies look delicious! I've decorated and had my holiday drink from starbucks. I just got my nails done in a bright holiday red and I love it! Totally holiday-esk! My nail color and coffee order get me in the Holiday spirit! The baking and decorations would do it for me. The manicure, not so much. Driving around and seeing all of the Christmas lights and decorations does it for me. Watching Christmas movies and listening to holiday music helps me get in ths Christmas spirit! For me it's Hallmark Christmas movies, cookie baking, making gifts, and jamming out to Christmas music! I need to do a festive holiday mani! We hosted a party already and did a cookie swap. I love this time of year so much! Ordering a holiday drink and getting a red mani are my sure-fire ways to get in the spirit! Those holiday treats look yummy! I just bought an oven so I'm gonna have to do some baking to inspire holiday thoughts. I don't need the help though since the onset of December, I've been into the holiday mood! These really are great ways to get into the spirit. We love to make holiday food and drink goodies and BLAST Christmas tunes. I love your holiday nails! We made christmas cookies, and are going to make a ginger bread house this weekend! Also blasting Christmas music all the time. These are such great ideas! I've been drinking holiday drinks since Starbucks started making them right after Halloween lol! I'm dying over your nails!!!! So cute! I'm hosting a holiday party this weekend with my boyfriend and I can't wait! Such great ideas! Also, you nails are adorable, I need to paint my nails soon! I love your reindeer mani! It's so cute! I love going to see Christmas lights and watching Christmas movies. I just sent out my cards yesterday... #SoLate but better late than never! This season has been so crazy, I'm trying to do everything I can to feel festive this year! Love all of these ideas!!! I love christmas time, it's so festive and fun! Oh my god your mani...bless. How stinkin' cute! oh my gosh yes! Baking is the perfect way to get into the holiday spirit! That manicure is the CUTEST! I definitely agree about throwing a festive party...that always helps. And wearing red! Your nails are too freaking cute! I love them! These are great tips! Baking always get me in the holiday spirit! Such a fun list! Hope you had a wonderful Christmas!